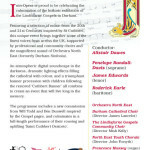 Alistair Dawes conducts the culminating event in the celebrations surrounding the presence of the Lindisfarne Gospels in the North East (July – September 2013). 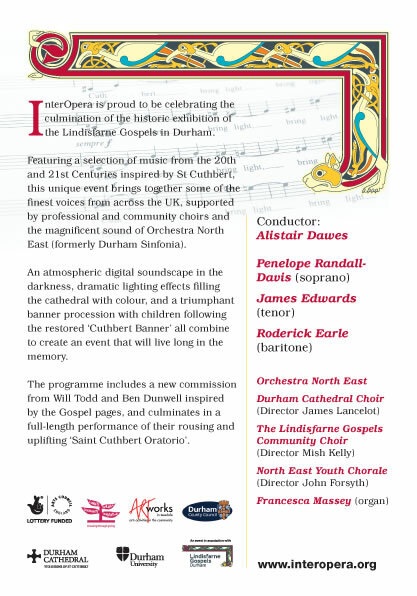 This event created by IO:InterOpera integrates professional and amateur musicians and performers from the age of 7, drawn from across St Cuthbert’s region to present a spectacular multi-media event. The St Cuthbert Oratorio, with text by Ben Dunwell set by Will Todd, forms the centrepiece of the evening which opens with The Prelude : the sound of the Bells of the Banner of St Cuthbert are followed by Sound Story by sound Engineer Neil Combstock, preceding the Durham Cathedral Choir, Director: James Lancelot, singing the Ikon of St Cuthbert of Lindisfarne (John Tavener). Organist Francesca Massey plays Messaien’s Les Anges before the Banner of St Cuthbert leads a procession of children’s banners during the singing of the Hymn to St Cuthbert. 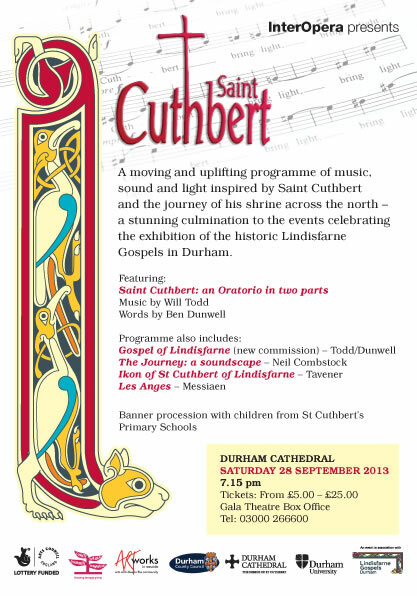 The Durham Cathedral Choir perform a new commission by Will Todd and Ben Dunwell, inspired by the Lindisfarne Gospels. 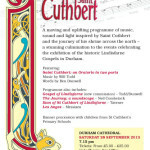 After a short interval, the St Cuthbert Oratorio follows the Prelude. Soloists Penelope Randall-Davies, James Edwards and Roderick Earle with the Lindisfarne Gospels’ Combined Chorus and Orchestra of the North East are conducted by Alistair Dawes. Interpretative lighting effects enhance the individual movements of the Oratorio. The performance is followed by a Peal of the Durham Cathedral Bells. Alistair Dawes – Conductor | Powered by Mantra & WordPress.